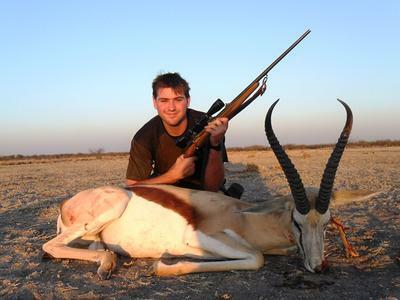 During October 2012 I was invited to my buddy Pieter du Plessis' uncle's farm in Botswana to hunt a trophy springbok and to help with 'pest control' with the lion, leopard and cheetahs that are creating havoc among the livestock. "Yeah, sure," I thought to myself. This farm is in the Ghanzi district, about 52km outside D’kar. Our campsite was near one of the view waterholes on the 10 000ha farm. The camp consisted of 3 old army tents that each can accommodate 4 people. It also had an outside shower and toilet. From the lapa you could observe the animals the whole day on the dry pans or the waterhole about 50 m away. The only power in camp was two 12v car batteries that powered a couple of strategic placed dim lights, all the rest was done by the camp fire. I was very excited about this hunting opportunity, but confronted with the dense sub-bushveld Kalahari terrain, littered with smallish dense 'swarthaakbosse' and no big tree as far as the eye could see, I wondered how on earth I was going to hunt there. Add to that the loose Kalahari sand where an inexperienced driver would not be able to travel without a 4x4, and I knew that I've got my hunt cut out for me. The two trucks that we had at our disposal, an old Toyota Land Cruiser and an even older Hilux, were... let's just say, 'well used'. None of their 4wd were working anymore, neither did they have any paint left on the sides as a result of all the years of bundu bashing through the shrubs, thorns and low bushes. The very first day I saw a beautiful springbuck with good horns and decided to take him immediately. When the 7x57 bullet hit him, he fell down and didn't even move! When I approached him, I realize for the first time that this was a really BIG specimen. We measured him and uncle Fanie told me that it was a excelled 17' trophy springbok! Man, was I ecstatic about this beautiful trophy! That evening around the campfire, staring at the flames, I still could see him in my mind's eye, standing there proud and full of himself. It's a dream that I'm going to dream over and over again! We talked till late that night and then planned the program for the next couple of days left of our hunting school holiday. When we finally got into the sleeping bags, I realized that I still had a grin on my face! 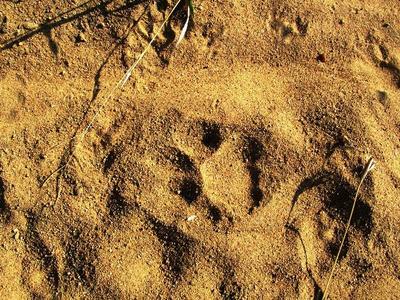 For the next four days we couldn't find any sign or tracks of the predators. On the morning of the fifth day, the Bushman tracker told us that there were cheetah tracks right next to our camp, where it had come in to drink water during the night. Uncle Fanie immediately went to fetch his three bushman trackers with their horses. We followed the tracks around the camp for some time, till the chief scout came to us and informed us that the tracks were not those of a cheetah, but a leopard! Uncle Fanie was very reluctant to follow the leopard's tracks, as one had recently pulled off his nephew's scalp! The three trackers were also very afraid by now and refused to follow the tracks any further. We called the neighbor, Uncle Schalk, who is an expert at hunting leopard. He had to bring his trained leopard tracker with him before our trackers would continue tracking. We then left the horses behind and the four Bushmen followed the spoor on bare feet, while we slowly followed them in the two old Toyota trucks. My friend and I were alone in the back of the second truck, him with the 7x57 and I with a Benelli 12 g shotgun loaded with SSG. There was nobody on the back of the first truck. it had laid down for the first time. About a 100m further on, the front Land Cruiser got a flat tyre and we thought that the leopard was now going to get too much rest so that we would not be able to catch up with him before nightfall. After a short while we had changed the flat tyre and we nervously continued following the spoor. You can imagine our shock and surprise when we realized from the signs in the sand that he had lain under a bush and observed us changing the tyre from a distance of not even 50m away! The spoor was very fresh and the Bushmen again followed it until they lost the spoor about 1km further on, and we all came to a stop. The chief scout walked back from the front of the first vehicle to behind our vehicle (the second vehicle) to see if he could pick up the spoor again. We suddenly heard an unearthly shout coming from this Bushman, and when we turned around, the leopard suddenly jumped up from behind a smallish bush ±3 m behind our stationary vehicle! We had passed it and were now standing nearly next to it! The leopard gave a blood curdling roar and then jumped clean over the terrified Bushman's head! I can now confess to you that I was nearly lame with shock and fear when all this happened so unexpectedly just next to me! One of the other Bushman then even jumped on the back of the truck with us and collided with my friends legs, pushing him off balance. By the time I got my wits together again, the leopard was in front of the truck, running away from us. When I turned around to the front, it was already about 20m away. Taken by surprise I instinctively shot it from behind. We immediately chased it with the two vehicles for about another 50m. Uncle Schalk was next to him first, and when he stopped, the leopard jumped on the bonnet of the Cruiser and off the left side where it went under a dense swarthaak bush. Everything then happened with lightning speed, and the next moment when our vehicle came to a dead stop, I saw that it was preparing to attack one of the Bushmen on the ground. Through the hazy dust I tried to keep my balance and the shotgun's sights on it. The moment we stoped, I let fly with my second shot of SSG at a distance of no more than 7-8m. This shot was luckily a good one, hitting the leopard in the chest and neck killing it on the spot before it could reach the Bushman. I was badly shaken when I got off the back of the truck, and I only then felt my arms and legs shivering from stress and fear after those hectic and terrifying blurry seconds. I was later told that there was only 10-20 seconds between my first and second shot, though I personally think the time was only about 7-12 seconds! Everything happened so quickly, that by the time I fired my second shot, my friend Pieter had only managed to open and close the bolt of his 7x57 for his first shot, which was luckily not necessary anymore. There was a lot of back slapping and congratulations that went on, and I could not wait for that evening to tell my dad far away about my incredible hunting experience. My heart filled with pride when he told me how proud he was of me! That night when I went to sleep I thought of how fortunate I was, and only then I realized that I still had a grin plastered on my face! Now for the Gr.12 final examinations, but after this experience, I think it will be a breeze! Awesome account of a dangerous game hunt and a Mathusaleh Springbok. Well done, young man! !